Regulation of gene expression—turning genes on or off, increasing or decreasing their expression—is critical for defining cell identity during development and coordinating cellular activity throughout the cell's lifetime. 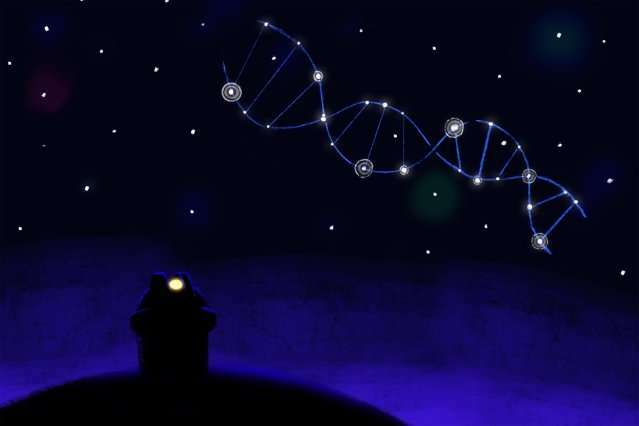 The common model of gene regulation imagines the nucleus of the cell as a large space in which molecules involved in DNA transcription float around seemingly at random until they stumble across a DNA sequence or other transcriptional machinery to which they can bind, in other words, a haphazard approach. This paradigm is being upended, however, as over the last few years researchers have discovered that rather than being amorphous spaces dependent upon fortuitous collisions, cells actually compartmentalize their processes into discrete membraneless structures in order to congregate relevant molecules, thereby better coordinating their interactions. Research from the lab of Whitehead Institute member Richard Young and others earlier this year reported that such compartmentalization is a crucial, previously-unobserved aspect of gene regulation. The latest research from Young's lab, published online Nov. 15 in the journal Cell, delves further into how such compartmentalization helps orchestrate transcriptional regulation by revealing the role of the activation domain, a part of transcription factors previously shrouded in mystery. One side of transcription factors, containing the DNA binding domain, binds to a region of DNA near a gene. The other end, called the activation domain, then captures molecules that impact gene expression, anchoring that transcriptional machinery near the gene. This most recent work reveals that activation domains do their job by meshing with other transcription proteins to form liquid droplets near the genes they regulate. The process by which the molecules form a distinct liquid compartment within the environment of the cell—like oil refusing to mix with vinegar in a salad dressing—is called phase separation. Such an evolved understanding of gene regulation has enormous implications for medicine and drug discovery, as errors in gene regulation are key components of many diseases, including cancers. The new model could help illuminate how diseases coopt regulatory mechanisms and how therapeutic interventions might remedy such dysregulation. Transcription factors have traditionally been hard to target therapeutically, and the incomplete understanding of their structure and function may have been part of the reason. "Transcriptional regulation is important for every human function, from cell differentiation to development to cell maintenance," says Ann Boija, co-first author and postdoctoral researcher in Young's lab. "Despite that fact the structure and function of the activation domain on the transcription factors have been poorly understood." Most proteins settle into defined three-dimensional structures and can only bind with other molecules that fit them perfectly in a specific orientation, like a key in a lock. The activation domains of transcription factor proteins, however, contain what are known as intrinsically disordered regions, which behave more like strands of cooked spaghetti, tangling at random into flexible shapes. This disorder allows the molecules to bind at many points, creating a dynamic network of loose connections that appears to precipitate phase separation. "I have taught regulatory biology for decades using inspiration from lock-and-key structures. They are elegant, and easy to visualize and model, but they don't tell the whole story," says Young, who is also a professor of biology at MIT. "Phase separation was the missing piece." In experiments with a variety of transcription factors, Boija and co-first author Isaac Klein, a postdoc in Young's lab and medical oncology fellow at the Dana-Farber Cancer Institute, found that the transcription factors meshed with Mediator, a molecule that helps activate genes, and phase separated into droplets, and that this process was associated with gene activation. The transcription factors they investigated included OCT4, which is important for maintaining the state of embryonic stem cells; the estrogen receptor (ER), which plays a role in breast cancer; and GCN4, a well-studied model transcription factor in yeast. "We found a link between gene activation and phase separation across a broad spectrum of contexts," Klein says, suggesting that this mechanism is a common feature of transcriptional regulation. The discovery has implications for many diseases, such as cancer, in which cancer genes may use phase separated droplets to help ramp up their expression. New therapeutic approaches could focus on dissolving the droplets, and drug discovery can incorporate testing of how the drug—or target molecule—behaves inside versus outside of the droplets. This new model of how transcription factors function is not only rewriting the understanding of transcriptional regulation, it is opening up new paths for drug discovery and therapeutic approaches.